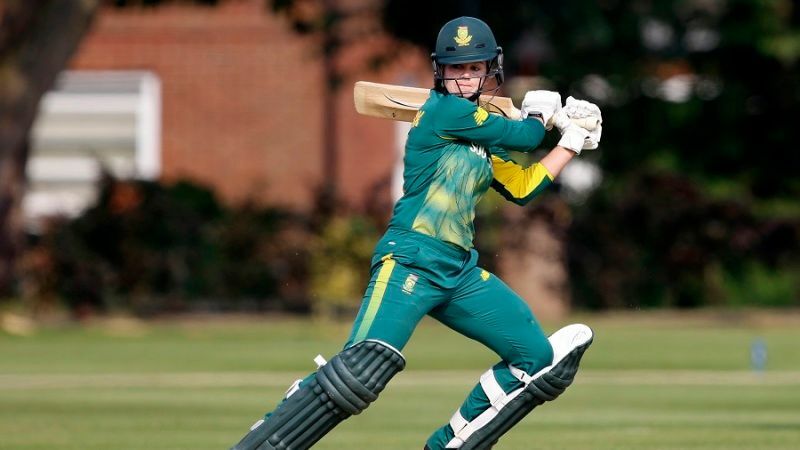 South Africa captain Dane van Niekerk continued her good run of form with the bat, scoring her maiden one-day international hundred to set up a seven-run win over Sri Lanka in the first of three ODIs in Potchefstroom. In a match reduced to 48 overs per side by morning rain, van Niekerk put on 117 with Andrie Steyn as South Africa reached 225 for 7. The hosts then held their nerve to overcome a Sri Lankan side who stumbled in the closing moments of a tight chase. Put in to bat by Sri Lanka, South Africa lost Laura Wolvaardt for a golden duck and Lara Goodall for 12 inside the Powerplay – both to Udeshika Prabodhani‘s medium pace – before van Niekerk joined Steyn at the crease for the definitive partnership of the match. The pair started sedately, raising a fifty stand composed largely of singles in the 21st over and the team hundred five overs later. In the meantime, Steyn also passed her own fifty from 81 deliveries and celebrated by lofting Chamari Atapattu’s offspin for the first six of the innings. Steyn was trapped leg before by Inoka Ranaweera moments after van Niekerk reached an 80-ball fifty, but the South African captain wasn’t slowed by a dismissal at the other end, racing through the 60s with a glide through gully and a pull over the midwicket boundary for six off Prabodhani. Van Niekerk stepped out of her crease to slap Oshadi Ranasinghe through the covers and then took Atapattu on with two boundaries down the ground in her ninth over. A fifth four, to long on, took van Niekerk to 99 and, with her spouse Marizanne Kapp batting at the other end, she then raised a 114-ball ton in the 46th over. During the course of her innings, van Niekerk also became just the fourth woman to reach the double of 2000 runs and 100 wickets in ODIs, after Lisa Sthalekar, Stafanie Taylor and Ellyse Perry. South Africa were well placed at 221 for 4 with two overs to go, but Ranasinghe then nipped van Niekerk and debutant Faye Tunnicliffe out in the space of three deliveries, van Niekerk slogging a catch to Anushka Sanjeewani at deep square leg and Tunnicliffe clean bowled. Kapp departed in the final over, South Africa having lost three wickets for the addition of 32 runs in the final five overs of their innings. Sri Lanka’s chase was powered by Prasadani Weerakkody‘s 47 at the top of the order and Shashikala Siriwardene‘s 49 in the middle. Weerakkody was particularly fluent on the drive, threading six boundaries through the covers in the first nine overs. The Sri Lankan openers put on 57 in good time, but van Niekerk brought herself on in the 11th over and struck immediately, pinning Sanjeewani lbw for 19. She followed that up with the big wicket of Atapattu, bowling her for 15, to further slow Sri Lanka’s momentum. By the halfway stage of their chase, the asking rate for Sri Lanka was already up to a run a ball. Siriwardene found the boundary often enough to keep them within touching distance of the rate, but when she edged Masabata Klaas through to Tunnicliffe behind the stumps one run short of her fifty, the pressure was on Sri Lanka’s lower order. The visitors needed 31 from 30 deliveries with Nilakshi de Silva settled at the crease, but three quick dismissals strangled their chase. Ranasinghe stepped on her own stumps while facing Tumi Sekhukhune, and Prabodhani and Achini Kulasuriya were quickly run out. Back to back boundaries for de Silva off Shabnim Ismail to end the penultimate over meant Sri Lanka needed 12 from the last six balls, but Kapp held her nerve to give away just four runs while sending down a miserly three dot balls in the last over to put South Africa 1-0 up in the series.